I've had a few pen pals in my day, and I must say that the joy that comes from seeing a card in your mailbox is better than any instagram like or blog follow I've ever experienced. You know immediately that a real person with whom you share a true connection with went out of their way to pick out the perfect card just for you, write something with words, no emojis, and even paid the small price of postage. All of this effort to show you that they are thinking of you and that they care. It seems like more of a rare occurrence nowadays. Communication has in fact gotten so bad that you aren't even guaranteed a response when you send a text message. I think that's why I admire people who still sit down and create something that helps keep pen-to-paper communication alive. 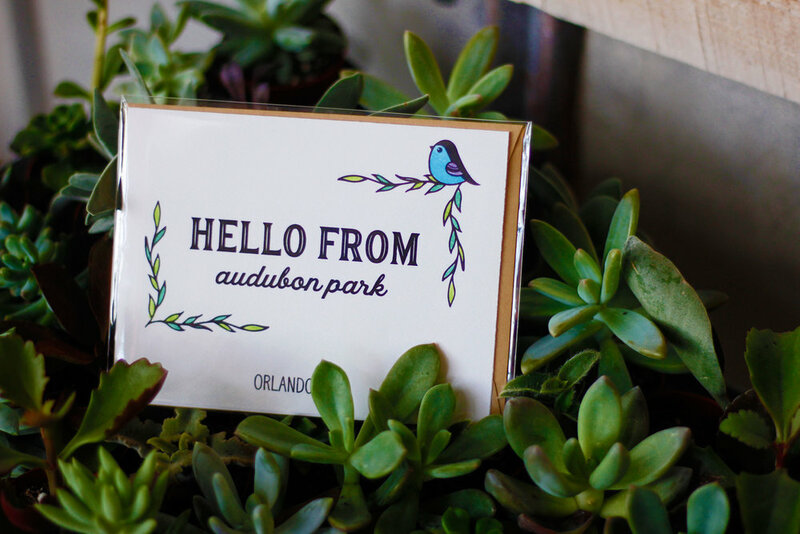 We have one such crafty lady here in Orlando and her business is Bright Light Paper. I met her years ago at a Yelp function and loved her cards, her style, and the warm greeting she gave me. One of her cards is even framed and has been hanging in my bathroom since our first encounter.Elizabeth began making cards about 4 years ago after a trip to San Diego. She had found a gift for her cousin and instead of sending it off on its own, she decided to make a handmade card to accompany it. Her art and the special touch of hand painting was loved and grew into a small business. 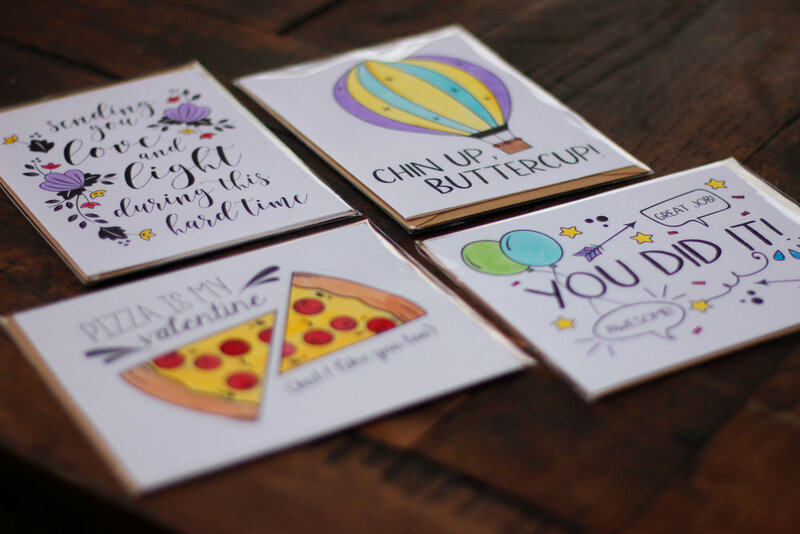 The name is an homage to her grandmother, who Elizabeth says was always a "bright light" in her life, and who too created her own handmade cards. By day she is a self-taught web designer, but it's clear that she has deeper artistic ability in her bones. "Don't be afraid to show your work. By sharing it you can get a feel and see if it could actually become a business. It's important to get comfortable sharing your work, so don't be afraid to put yourself out there. "Elizabeth has seen more than her share of personal tragedy in the past few years. Maybe none quite so horrific as losing her friend, another wonderful Orlandoan who made this city better, in a tragic accident on a trip they took together last July. I'm not sure how anyone could come back from what she has endured, but her attitude is a testament to how strong she is, and her focus is one that you instantly admire when speaking with her. She found her own way to honor her friend with a series of cards called "Constant Sparkle". They have special meaning to her and can certainly be used to cheer up, celebrate, or encourage a loved one. After all, if 2017 is anything like 2016 we'll need to bulk up on these cards and share them as reminders to our loved ones that we are here for them in a more meaningful and permanent way. When it comes to all things local, Elizabeth is a Mills/50 girl who loves good food. You'll find her eating at Black Rooster and Hawkers, hanging at The Guesthouse, and using all her will power to not live in Blue Bird Bake Shop. Her cards are available for purchase through her Etsy Shop, or you can pick them up while you are out exploring at the East End Market in Local Roots, Naked Bar Soap Company, The Lovely Boutique Market, Peterbrooke Chocolatier, The Gallery on Edge, or in Lake City at Fifth Generation Farms.